The recent Danny Boyle film 127 Hours is not very good. Or, more accurately, there's not a lot to it. 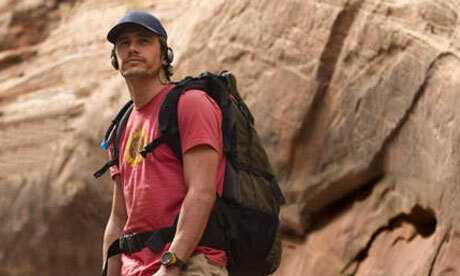 In the filim, James Franco plays Aron Ralston, a hiker who got his arm stuck under a rock while canyoneering in Utah in 2003. After the titular amount of time, Ralston amputated his arm with a generic Leatherman and walked to safety, having long since run out of food and water. Boyle does a good job ratcheting up the tension (despite everyone knowing exactly what's going to happen and when) but doesn't really give us anything beyond the guy-standing-next-to-a-rock narrative. Well, that's not quite true. He tries to give us more, but comes up short. As he's running out of water and energy, Franco gets out his camcorder and records a good-bye to his parents and family. Then, as his delirium increases, he starts talking about other things in his life. One of the things he reminisces about is his tendency to tell no one his canyoneering plans, as the solitude adds to the adventure: he's more of a heroic character if there's no possibility of rescue. Boyle's mistake is introducing this potentially powerful idea more than halfway through the film. As he faces his more and more imminent demise, Franco chastises himself about this sort of faux heroism and terminal self-reliance.After the auto-amputation, he walks out of the canyon and spots some other trekkers. Boyle shows everything out of focus, Franco unable to muster the strength to speak. Finally, he shouts, "Help me!" Then Boyle cuts into a crystal-clear close-up in which Franco exclaims,enunciating clearly, "I need help!" This character arc (as poorly developed as it is in the film) is a distinctly Christian one. The Law, says Paul is Galatians 3, served as a "disciplinarian until Christ came." In other words, the Law functions to drive us to to Christ, to our need for a savior. That rock in the Utah canyon was Franco's "disciplinarian," driving him to acknowledge his need for a savior, driving him to his admission that he needs help. Of course, now that Christ has come, Paul says that we are no longer under a disciplinarian. That's the Good News...that the boulders of our lives, the painful teachers, hold no more sway over us, and we are free.